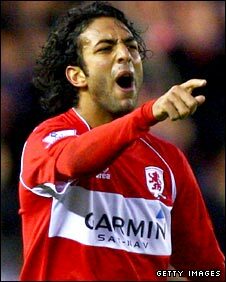 Middlesbrough and the Football Association say they are "disappointed" a Newcastle fan who racially abused Mido has escaped a banning order. Barry Hutchinson, 49, pleaded guilty to an offence of racist or obscene chanting during the Magpies' 0-0 draw at Middlesbrough on 29 November. Hutchinson was fined £270 with £45 costs, while his son Andrew Hutchinson denied the same charge. "We are disappointed a banning order was not imposed," said an FA spokesman. "It is important to send out a strong message that racist and discriminatory chanting is totally unacceptable, and that anyone found guilty will face the consequences." A Middlesbrough spokesman said: "It makes it very difficult for football clubs to have a robust anti-racism policy without the support of the courts. "Despite this setback we will continue to be vigilant and supportive of police in tackling all discriminatory and anti-social behaviour. The individual concerned will be banned from the Riverside Stadium." Mido, 25, suffered similar abuse during the corresponding fixture at the Riverside last season but no action was taken because police were unable to identify the culprits. "It happened again because after the first time the English FA did nothing," Mido told Egyptian TV station Al Hayat. Last week Piara Powar, director of anti-racism campaign Kick It Out, called on football supporters to help "self-police" any racist incidents on the terraces. "The police are now saying they are going to put in extra monitoring for the next game, but by then it will be too late," he said. "What we need is for the police to go over the CCTV footage and do what they can, in similar way which they are in Hampshire concerning the recent incident with the Tottenham fans at Portsmouth. "The key change we do have in English football now is there is self-policing, peer pressure which supporters who understand the implications can put on fans who are involved in abuse."